When water isn’t contained, it can quickly become disastrous. If your home or office has an unexpected water emergency, you have to make the right choice for fast, effective emergency water removal services. In Chicago, ServiceMaster of Lincoln Park is ready to help you take back your property. Call us at (773) 346-6767 - 24 hours a day, seven days a week for our leading water removal services. While many people may think of the weather — such as excess rainfall — as the main source of water damage, it can actually have a variety of roots. 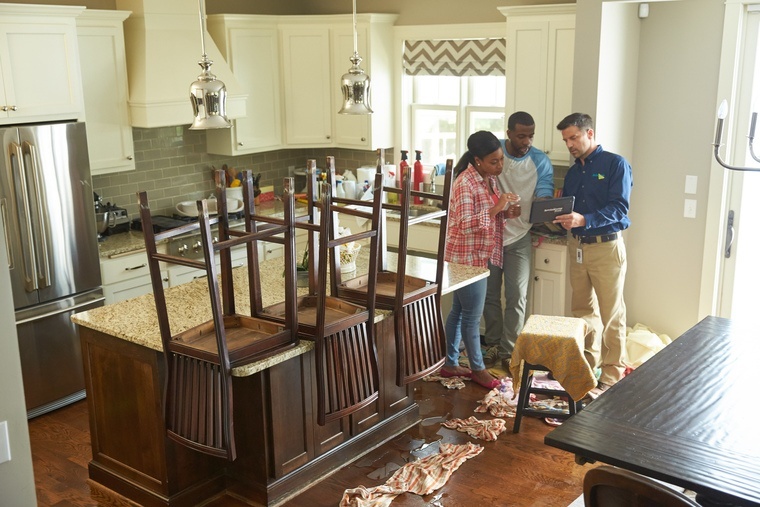 At ServiceMaster of Lincoln Park, we regularly see water damage that comes from overflowing appliances, burst pipes, sewer backups and other sources in addition to rain-related floods and leaks. Regardless of why you need emergency water extraction in Chicago, we are prepared to restore your flooded areas. Excess moisture that isn’t immediately removed can lead to health problems and allergic reactions due to mold, mildew, and infestation of rodents and insects. This means every person in your residence or at your office building is at risk when flooding is involved. Our water removal services are comprehensive, and the procedures we use enable us to completely dry out the affected areas, ensuring you have no excess water left in the space. Calling ServiceMaster of Lincoln Park at (773) 346-6767 is the quickest way to avoid problems related to moisture buildup. ServiceMaster of Lincoln Park is a trusted water damage company in Chicago, IL. Every time you choose us, you get our guarantee. This means if you aren’t 100% satisfied, we’ll keep working with you until you are. It’s the strongest promise you can get among suppliers of emergency water removal in Chicago, and it’s one of the main reasons our customers appreciate us and refer our team to their family, friends, and coworkers. It can be stressful to deal with water damage. Our team members are available night or day to come to you and give you a thorough evaluation and diagnosis of your water problems. From that point, we will work rapidly to extract all the water from your flooring, walls, ducts and furniture. We can also help you discuss any water damage related questions with your insurance carrier. ServiceMaster of Lincoln Park has the experience to talk with insurance providers on your behalf. Premium water removal services are just a phone call away. Trust ServiceMaster of Lincoln Park Chicago the next time water threatens your peace of mind.